The white Lily is a symbol of purity and chastity and is known as the Easter flower. In Christianity the angel Gabriel is traditionally depicted with a white lily when he announces to Mary she is to bear the son of God. Our Lily Nouveau design celebrates Springtime. 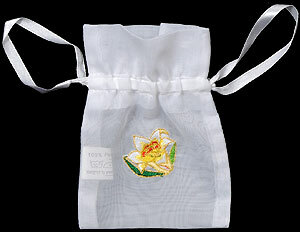 A selection of our designs have been beautifully embroidered onto favour or small gift bags. These small bags can be used for small gift items and also are very popular as wedding favours filled with sweets, soaps, lavender or pot pourri.